Club d’Elf’s long-awaited studio follow-up to 2006’s Now I Understand is due to be released April 5. Not content to release just a single CD, the band completed enough music for TWO separate CDs which will be packaged together. Titled Electric Moroccoland/So Below, it showcases the diversity of D’Elf’s music, and represents two distinct sides to the groups sound: unplugged, Moroccan trance; and dark, sci-fi-dosed funky electronica with DJ-driven beats. Give a listen to excerpts from each one: Electric Moroccoland & So Below. The band toured Japan at the end of December to celebrate the release in Japan on Akashic-Ensemble of Electric Moroccoland (So Below to follow). 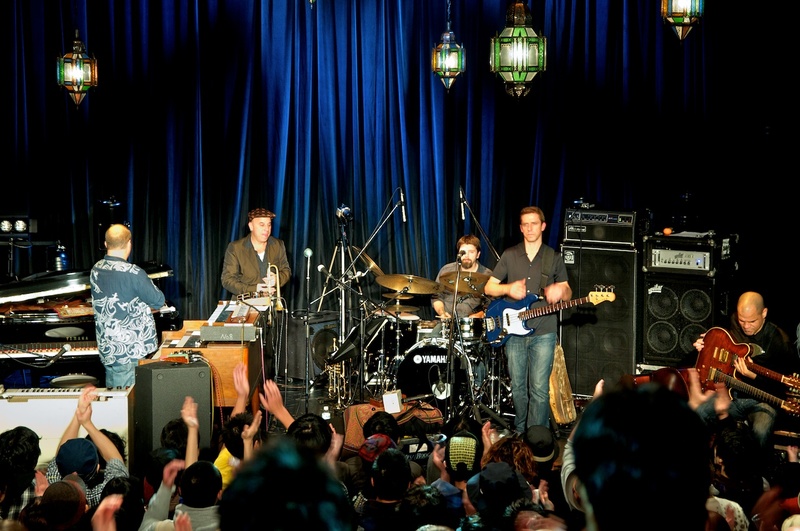 With special guests John Medeski, Dave Fiuczysnki & Steven Bernstein along, the band rocked shows in Chiba, Tokyo & Gunma. Check out Micro’s blog about the tour here. Hassan Hakmoun makes a guest appearance on Electric Moroccoland and has been joining the band for live shows recently, including this one from 12.13.10 at the Lizard Lounge in Cambridge, where the band held a benefit for musician friend (and contributor to Electric Moroccoland) Kousmat Mohammed. Moroccan music, and especially Gnawa and Berber music, has increasingly become a dominant flavor in the tagine of the band’s sound, and the group has been setting it’s eyes on more cultural events such as the Mimouna festival hosted by the New Center for the Art & Culture, where D’Elf was featured in April ’10 and plans to return this year. Bassist & leader Mike Rivard received a 2011 Somerville Arts Council arts fellowship grant, which he plans to use for the purchase of a new sintir. His trip to Morocco in Dec 2009 is detailed in several blogs, found here, here & here, and was financed by the University of The Middle East & the US Dept of State. He also received an Iguana Music Fund grant to help finance completion of Electric Moroccoland. Oud player & percussionist Brahim Fribgane just returned from Senegal, Africa, where he performed Jan 3rd with Hassan Hakmoun at the World Festival of Black Arts in Dakar. ~ by delfblog on January 13, 2011.